Before Predator 2 was ever conceived as a film, writer Mark Verheiden and artist Chris Warner created an acclaimed comic-book sequel to Predator that took the alien trophy hunters from the jungles of Central America to the concrete jungle of New York City--where they face Dutch Schaefer's big brother, who's an NYPD detective! 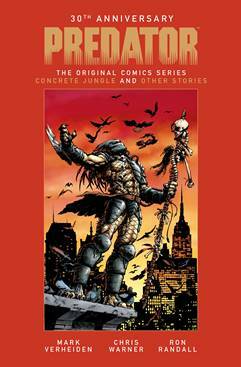 Also included in this volume are Verheiden's two subsequent Predator stories--Cold War, which finds the Predators crash-landed in Siberia, and Dark River, in which the hero of Concrete Jungle traces the path of his younger brother to find out what really happened to him after the events in the movie Predator. Three now-classic tales in one over-sized, deluxe hard cover volume designed to sit on your bookshelf beside the Aliens 30th Anniversary edition!